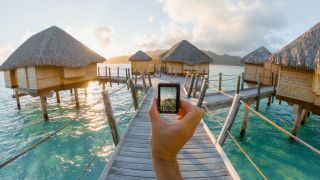 ‘Shaky video is dead’ proclaims GoPro, as it introduces the new Hero 7 Black, featuring unprecedented levels of video stabilisation for any type of camera as it vies for top spot among the best action cameras you can buy right now. GoPro Hero 7 Black: What’s New? The new feature is named ‘Hypersmooth’. GoPro claims it’ll make capturing smooth, gimbal-style footage easier than ever, to the point where you might as well chuck your gimbal away. Indeed, in its release material, GoPro claims this is not only the most advanced stabilisation system ‘ever featured in a camera’, not just any action camera. It’s a 3-axis system that works underwater and in high-shock, high-wind situations (i.e. exactly the sort of situations people tend to take GoPros into). GoPro has released a useful comparison video on its YouTube channel to show off the difference Hypersmooth can make to moving footage. The Hero 7 Black boasts a few more new features too. There’s new ‘TimeWarp’ mode, an automatic mode for creating super-stabilised time-lapse videos, distilling long sequences into polished, shareable clips that are only a few seconds in length. On the subject of sharing, GoPro has long been proactive at introducing new and interesting ways to share content into its devices, and the Hero 7 Black is the first GoPro Hero camera to enable direct livestreaming to platforms like Facebook Live, Twitch, YouTube, Vimeo and more. New Short Clips mode also restricts recording to 15- or 30-second clips, further facilitating easy sharing to social media. Stills shooters haven’t been forgotten about, with new SuperPhoto mode providing intelligent scene analysis and optimised shots with automatically applied HDR, tone-mapping and noise-reduction. For the social media crowd, there’s also a native vertical capture Portrait Mode, designed for sharing to Instagram Stories or Snapchat, while new Face, Smile and Scene Detection modes also work with GoPro’s QuikStories mobile app that assembles clips and montages for easy sharing. Like the Hero 6 Black before it, the GoPro Hero 7 Black shoots pristine 4K video at 60p and can capture slow-motion Full HD video at up to 240fps -- eight times slower than normal speed. It shoots 12MP stills, can attain a maximum burst speed of 30fps, and can capture in RAW format. It’s waterproof without a housing down to 10m, and the 2-inch touchscreen on its back enables Touch Zoom functionality, which allows for quick, precise framing of subjects. Voice Control enables hands-free operation, working in 14 languages, and there’s also the option to have your images automatically back up to the cloud using the GoPro app, which not only gives you peace of mind but also allows for on-the-go sharing. There’s built-in GPS, and the option to use it to add stickers tracking things like speed and elevation to your videos in the GoPro app. As have many GoPro release before this one, the GoPro Hero 7 also comes in Silver and White editions, which are versions of the same camera with a few features missing but sold at a more affordable price. The GoPro Hero 7 Silver first. This camera is still 4K, but it shoots at a slightly reduced frame rate of 30p. While it has some stabilisation functionality, it isn’t the 3-axis HyperSmooth version that’s debuting on the Hero 7 Black. It can also only shoot slow-motion footage at half-speed, not 8x slower like the Black. Stills-wise, it shoots at 10MP rather than 12MP on the Black, and its maximum burst speed is 15fps rather than 30. While it doesn’t have SuperPhoto mode, it does have a Wide Dynamic Range functionality that can be used to push shots a little further. It records sound with a two-microphone setup, whereas the Black uses three. The GoPro Hero 7 White doesn’t shoot 4K, and while it has the 10MP of resolution that the Silver has, it doesn’t have the Wide Dynamic Range functionality. Unlike the Silver, it also lacks GPS. All three new GoPro Hero 7 models are available for pre-order now and will be shipping on September 27. They are priced as follows: £379.99 / $399 for the Hero 7 Black, £279.99 /$299 for the Hero 7 Silver and £179.99 / $199 for the Hero 7 White. The new action cam should make its debut at Photokina 2018.